Acronym for light amplification by stimulated emission of radiation. The acronym also refers to the physical instrument used in realizing the process. 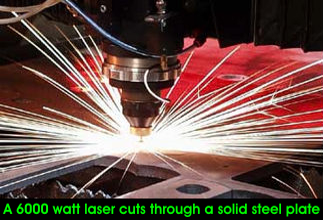 Lasers produce concentrated beams of light which are used in science, industry, defense, medicine and the arts. Lasers work by causing electrons to release large numbers of photons at a particular wavelength and in a coherent fashion. In most lasers, the first step in this process is to cause the electrons of a suitable substance to store extra energy. Energizing is done by applying electricity to the substance or exposing it to high intensity lamps. When the electrons are fully energized, they are further stimulated causing them to release their stored energy in the form of photons. Those photons are then reflected back at the substance by mirrors causing the release of even more photons. With each emission-reflection cycle, a greater number of photons are generated resulting in the light amplification effect. The amplified light is of a single wavelength and the crests and troughs of all light waves are aligned with each other. Inside the laser, one mirror is partially silvered, so that when the light amplification reaches a certain intensity, a light beam escapes. When this happens the laser emits a laser beam. In ufology, lasers have been used in UFO hoaxes and simulations. 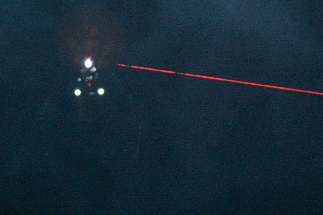 Jeff Wilson won a contest in The 2007 3rd Annual Speaking of Strange UFO Experience for his triangular UFO with an onboard laser ( pictured left ). Wilson's simulation emulates the famous Belgium radar/visual UFO sightings during March 30 and 31, 1990. However the Belgian UFO was reportedly much larger and faster. Although at least one claim has emerged that the famous Belgian UFO photo was a hoax, no proof of a hoax has been provided, and even if that picture had been hoaxed, there still remains several other independent factors to the Belgian wave that have not been reasonably explained.